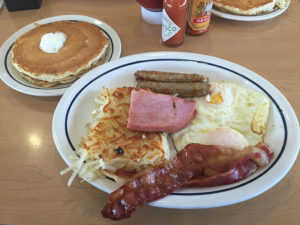 It’s hard to go wrong with an IHOP, I mean, it’s an International House of Pancakes. How can a house of pancakes be bad? Well, it’s possible. It’s difficult to have a good dining experience when your waiter doesn’t speak your language, and keeps running away when you’re trying to say things to him. We weren’t being mean, or confrontational or anything, but if you are going to have to mime things at them so you’re understood it would be helpful to have a single conversation and not have to keep trying to get their attention before they run off somewhere else “We’d like sugar, ketchup and some napkins please”. Those requests shouldn’t take 10 minutes. Aside from the service, the food was ok. 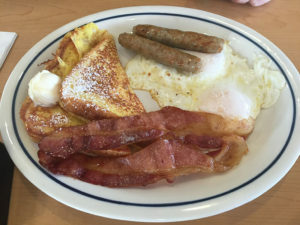 Nothing fantastic, not even the usual “great” that we normally get at IHOP. Unpleasant experience all around. We were starving, after coming back into town from driving down the coastal highway. It’s always a struggle when you are unfamiliar with a place to spot a restaurant you’re willing to try out. Especially when you’re starving and don’t want to risk not getting a decent meal and still being hungry. 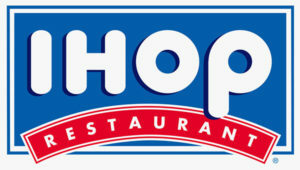 It was great when I spotted the IHOP, we’d driven past one the day previous (or so) and had missed stopping, so I was happy to get the chance. Not something we can do regularly in Canada, so it’s one of the stops we always like to make on vacation. Unfortunately the experience wasn’t that great, and we ended up leaving more disappointed than when we’d entered – even if we had full stomachs. Our waiter was a challenge. Now in the service industry, you really need to be able to speak English. I have no problem with accents, or having a bit of a barrier, but when you are totally on a different page, as a customer it makes my life more difficult than I need it to be. In our situation, ordering was a challenge, and throughout the meal we had requests for things. Like the iced tea my wife got was unsweetened, we wanted some sweetener. She got served cream, twice – after we asked, twice. The waiter would rush off before we could properly communicate, especially when it looked like he wasn’t understanding what we were asking. Getting a refill was just as difficult, “In the same glass?” we got asked. I dunno if people have a preference for that sort of thing, I personally don’t care, we just wanted fresh drinks. We ended up getting them separately because my wife asked, and he brought hers, then I had to ask to get my empty filled. My wife didn’t have enough bad to say about the women’s restroom. Apparently it was quite a staggering mess, with TP all over the soaking wet floor (wet from who knows what).